Question: I have been trying to decipher the wild steelhead regulations and the definition of anadromous waters. Based on what I’ve read, I believe a rainbow trout is considered to be a wild steelhead if it meets the following criteria: 1) is 16 inches in length or greater, 2) has an intact adipose fin, and 3) resides in anadromous waters (waters that somehow connect to the ocean). Is this accurate? Are there wild steelhead trout in non-anadromous waters? Answer: Steelhead are rainbow trout that migrated out of fresh water as juveniles and spent some portion of their life in the ocean before returning to fresh water to spawn. 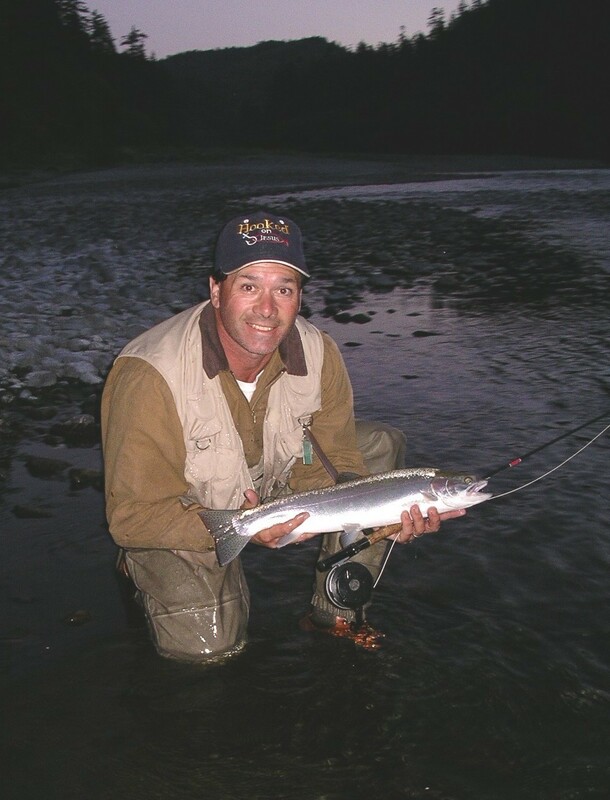 According to Steelhead Program Coordinator Terry Jackson, adult California steelhead are usually at least 16 inches in length. It is not possible to be sure, however, if a large rainbow trout (16 inches or larger) in anadromous waters has been to the ocean without examining a scale (fish scales can be “read” like tree rings) or an otolith (a bone in its head, which unfortunately requires sacrificing the fish), so this regulation reflects probabilities based on years of data. Your basic wild steelhead definition is correct, and in most cases any wild steelhead caught must be immediately released. One exception is the Smith River, where some harvest is legal (current limits are one wild steelhead per day and five annually). In addition, harvest of hatchery steelhead (adipose fin-clipped) is allowed in many streams in the state, so check your freshwater fishing regulations for specific waters (CCR Title 14, Section 7.50). As to whether wild steelhead live in non-anadromous waters, for the purposes of the regulations and the Steelhead Report Card, the answer is no. Technically, some rainbow trout that originate in non-anadromous waters (such as above a dam without a ladder or falls) will occasionally escape and migrate downstream to the ocean. But when they return as adult steelhead, they remain in the anadromous portion of the stream. Legal to Watch Wildlife by Spotlight? Question: I know that it is not legal to spotlight hunt, but what if I’m just out looking around in the dark with my vehicle’s headlights on and I happen to have a rifle, shotgun or bow with me? Can I get in trouble for just looking around if I’m not even hunting? 2) You have in your possession or under your control any firearm or weapon with which those mammals can be killed, even if no mammals are killed, injured, shot at, or otherwise pursued (FGC Section 2005). According to Game Warden DeWayne Little, it is not the game warden’s responsibility to determine the intent of the person spotlighting. Unfortunately, too many deer are poached at night with the aid of artificial lights so this regulation is strictly enforced statewide. Game warden pilots even fly night patrols specifically to locate spotlighters who are poaching wildlife at night. If you want to view wildlife at night with lights, leave your guns and bows (or anything that can be used to take game) at home and be aware that if you are observed shining a light, you will be stopped by law enforcement and questioned about your activity. You should realize too that this stop may be done at gunpoint and your vehicle will be searched for weapons, as spotlighting is considered a high-risk crime. Are Pulsator Decoys Legal for Waterfowl Hunting? Answer: Yes, they are legal to use throughout the waterfowl season. This entry was posted in Decoys, Fines/Penalties/Citations, Fishing, Regulations, Waterfowl, Wildlife Life/History and tagged Duck Hunting, Poaching, Spotlighting, Steelhead Fishing, Trout Fishing. Bookmark the permalink.